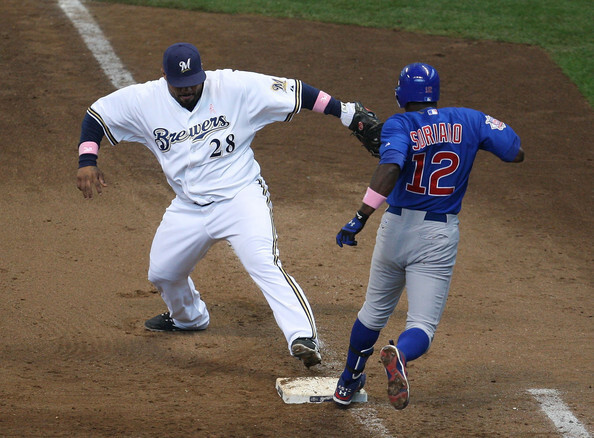 Could Prince Fielder End Up a Cubbie? ~ The Bucky Channel - The World of Sports from Wisconsin's Perspective. Home » Brett Favre , Chicago Cubs , Milwaukee Brewers , Minnesota Vikings , Prince Fielder , Sports Illustrated » Could Prince Fielder End Up a Cubbie? It's discouraging to watch the Brewers this season and realistically be aware of the fact that it's going to be pretty damn tough to sign Prince Fielder long-term. It's more discouraging when you hear that Prince Fielder and his agent Scott Boras are rumored to be looking for a deal in the 8-year, $200 million range. But what's even more discouraging than that is when you realize one of the likely destinations for him could be ninety miles south, as a member of the Chicago Cubs. It's the most speculative of assumptions at this point, but it's a realistic possibility that we should be aware of. Jon Heyman of SI.com wrote a nice piece this morning looking more in depth at how the negotiations between Prince and the Brewers are likely to go, but he also names five possible clubs that could be his landing spot. His most likely scenarios? Seattle, San Francisco, the Dodgers, the Mets, and yes, the Cubs. His 11 home runs at Wrigley are his most in any opposing ballpark, and his 1.076 OPS is his highest at any park with at least 50 at-bats. Incumbent Cubs first baseman Derrek Lee is a free agent at year's end. The point of my question isn't to debate how likely it is for him to go there, as you'd like to think that he wouldn't. But then again, a quarterback we loved for 16 years went ahead and played in Minnesota, so you never know. I'm trying to think here, and I think Prince as a Cub would be worse than Favre as a Viking. Instead of leaving when he was a 39-year old bitter choke artist like Favre did, Prince would be leaving in his prime to a division rival we'd have to face some 15 times a year, rather than just two. And when Prince left, he would for sure thank all the fans in Milwaukee, but it would still sting because money would be the sole reason he'd leave. I'd have to think that would be worse. Plus, Prince wouldn't cheat on his wife like Favre does constantly. and what proof do you have favre cheats on his wife? or are you just a whining spiteful cheesehead that is bitter that your team traded a legend so you accuse him of this!! !your an idiot!!! Never reading this blog again. Sounds like a 13 year old was writting the strange bitterness towards the end. Tell you what, I'll keep pouring hours of work per week into this site, finding any spare moment I have to keep this updated. If you could, just please send me information on what you'd like me to write and how you'd like me to write it, and I'll cater this blog towards you.